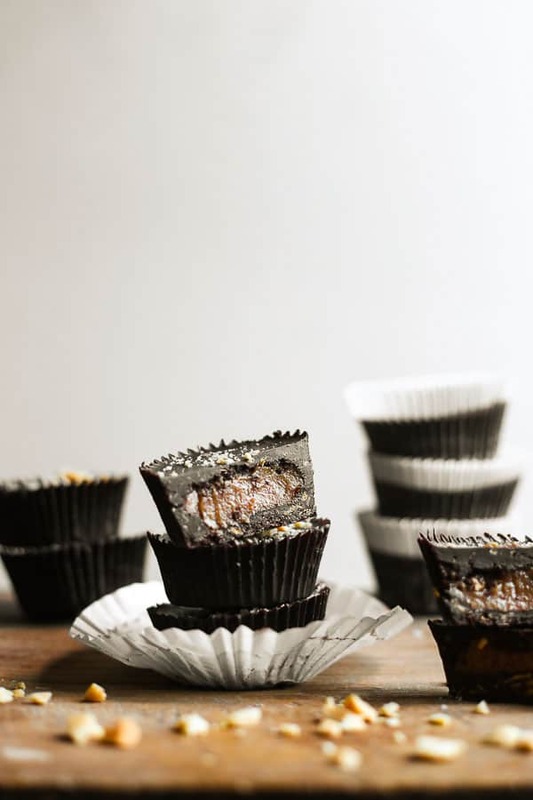 Chocolate Peanut Butter Caramel Crunch Cups are vegan, gluten-free and refined sugar-free but most importantly, absolutely heavenly. So I have got into a nice little habit which like all my habits start off as something well intentioned but ultimately turn into an unhealthy obsession until I have to stage a self-intervention and no longer allow myself to indulge in the habit further. This current habit is… making my own chocolate. Oh by gum I am loving it. It all started a few months ago when I was asked to make a refined sugar-free, vegan, soy-free, gluten-free chocolate cake. The recipe for the cake itself wasn’t a problem, but finding quality chocolate for the ganache that ticked all these requirements wasn’t an easy task. It also surprised me how many bars of chocolate that claimed to be vegan also said ‘may contain dairy.’ This left me baffled. And a dairy-free chocolate that didn’t contain soy felt like the holy grail. Also sugar. 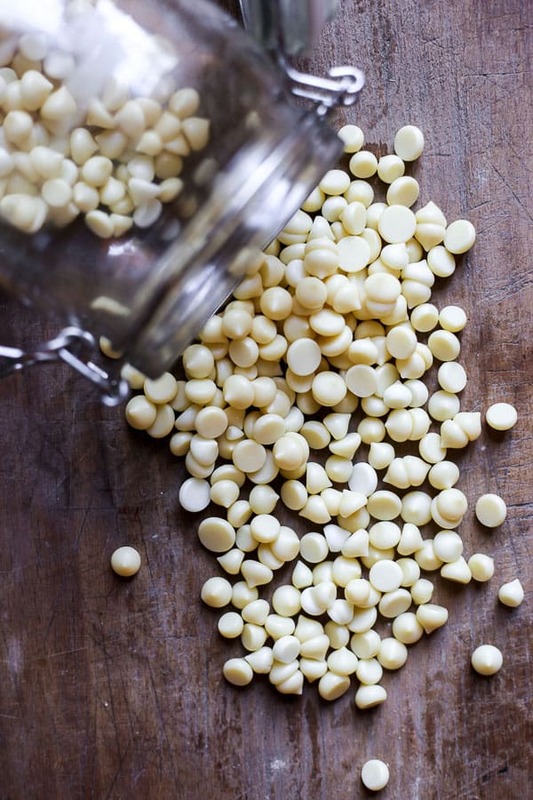 Turns out chocolate producers like to put actual sugar in their chocolate, who knew? I did eventually find an artisan 70% dark chocolate bar without dairy or soy and made with coconut sugar. Of course the cost was obscene. I really didn’t have an option. I was going to have to make my own. It turned out that making my own chocolate from just a few ingredients was ridiculously easy. The resulting cake was splendid and everyone involved was incredibly happy. Especially me, as now I knew how to make my own healthy and guilt-free chocolate. This could only be a good thing, yet more ammunition for me to enjoy a balanced and less processed diet. Without a doubt this would lead to weight loss, wellness and unqualified happiness. Sure. If you are a remotely restrained human being. That is not me and I am on the homemade chocolate train and riding it all the way to Disneyland and back again. Happiness indeed. Now this homemade chocolate isn’t made the same way actual chocolate producers make their posh bars but this homemade stuff is actually pretty brilliant. And incredibly addictive. Cocoa Butter. The base of the homemade chocolate is cocoa butter which you can easily get hold of on Amazon or your local health food shop. You can buy it in blocks of raw cocoa butter but it’s better for this purpose to buy in chips for even melting. The cocoa butter is melted with coconut oil which is used to help solidify the chocolate. Cocoa powder is then whisked in for the chocolate taste. Add-ins. It’s up to you to leave plain or go crazy with the add-ins. Set. All that’s left is to set the chocolate in the fridge or freezer. You can use chocolate moulds, a parchment lined Tupperware box, or muffin cases. This homemade chocolate isn’t as stable as properly processed chocolate and it melts easily so you will need to keep it in the fridge once it has set but that’s no issue at all as it’s wonderful direct from the chiller. 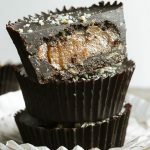 I have been loving experimenting with homemade chocolate but in this recipe for Chocolate Peanut Caramel Crunch Cups things are getting really exciting. Now I spoke above about the option of add-ins for your homemade chocolate. I’m talking about chopped nuts, dried fruit or crushed cookie pieces. For this recipe though we want some crunch to our chocolate, to contrast with the thick smoothness of the caramel. The crunch element of choice here is gluten-free cornflakes. Now I’m not a big cereal-for-breakfast fan, but cereal-in-desserts is another matter entirely. I grew up on chocolate cornflake treats and this here is just a grown up version of that. Not only do these cornflakes give the chocolate crunch but also that unique, almost malty, cornflake flavour that is so reminiscent of childhood. Check your labelling if you are looking for refined sugar-free. 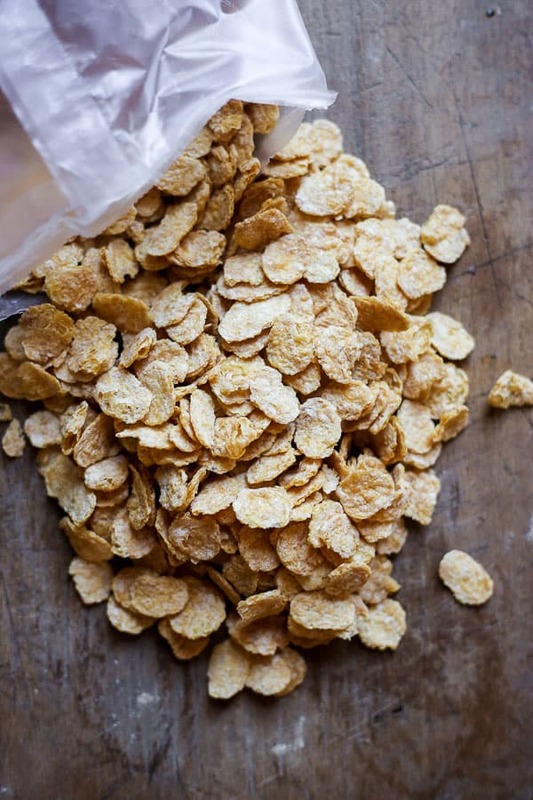 There are various brands of gluten-free cornflakes that either have no sugar involved or are made with unrefined sugar and also some made with regular sugar. It’s up to you which you choose. If you are going for completely unsweetened cornflakes though you may want to increase the amount of maple syrup used. For this recipe I used cornflakes slightly sweetened with rice malt syrup. 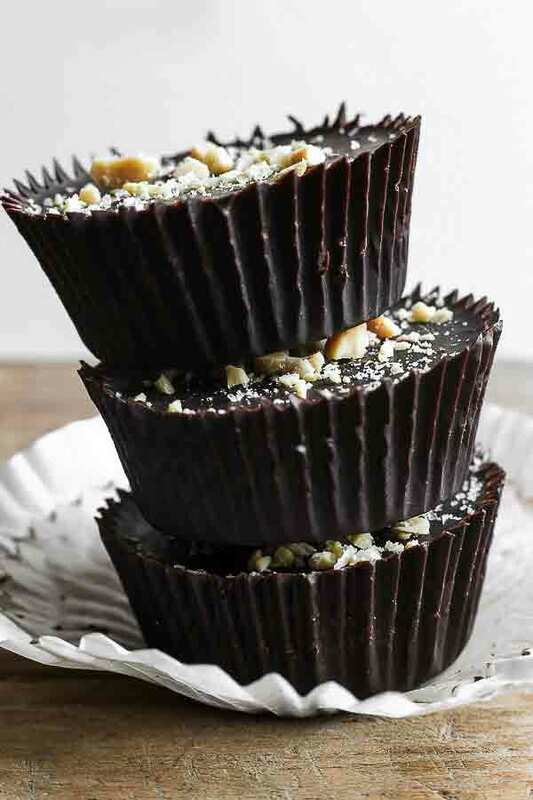 I have been making different versions of chocolate cups since Beau was born. They were my little treat during night feeds when I needed something to stay awake. They are so easy to make as you just need cupcake cases, melted chocolate and a filling of some sort. 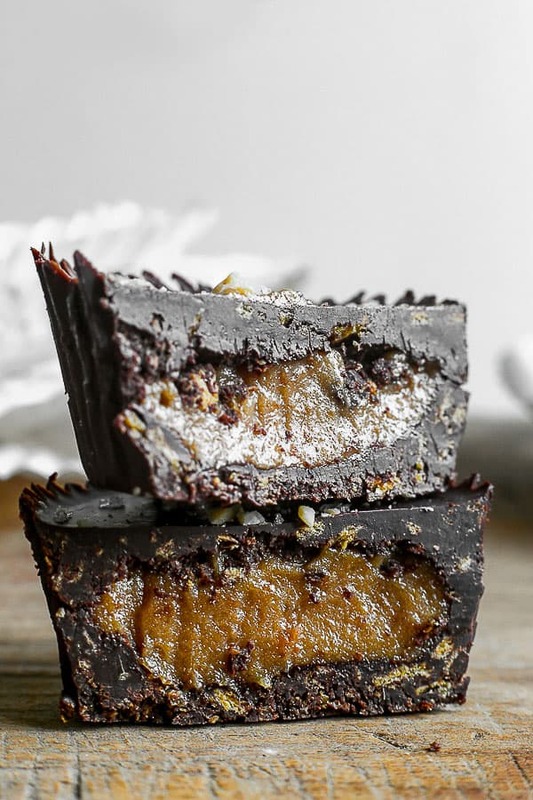 The idea is based on Reese’s Peanut Butter Cups of which there have been countless versions of pervading food blogs for years. Here though, I wanted something a little less sinful but that still tastes just like you are sinning. 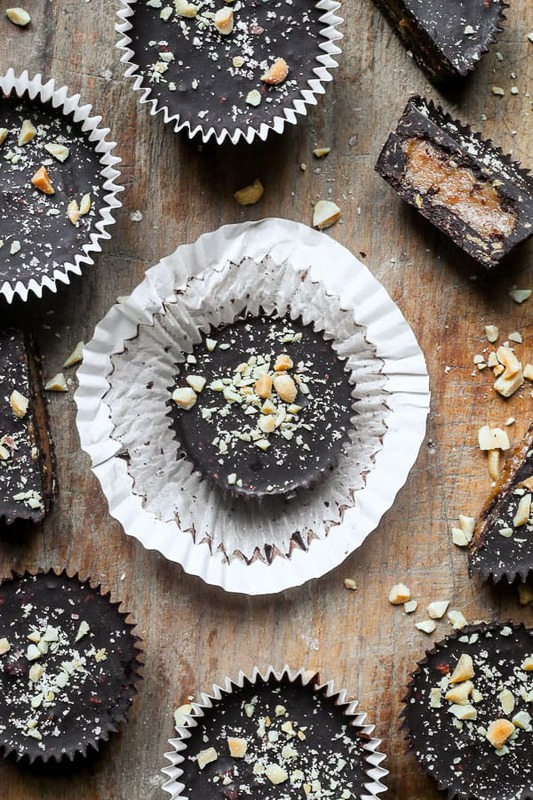 This filling takes peanut butter cups to the next level. First we make a vegan and sugar-free caramel by blending chewy sticky medjool dates with hot water, for a smooth drippy consistency, and coconut cream to really make it taste like actual creamy rich caramel. It’s such good stuff. 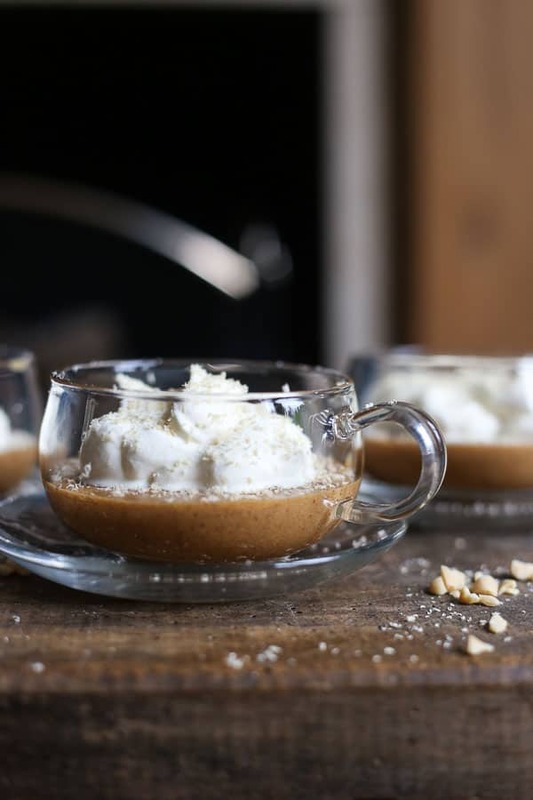 Add a bit of vanilla and salt and you have a refined sugar-free and vegan caramel which is out of this world. I’m not vegan so I eat proper caramel all the time and I am still thrilled with the date caramel option, it has such depth of flavour and a perfect consistency. When we blend in a natural peanut butter into this caramel the situation suddenly gets serious. 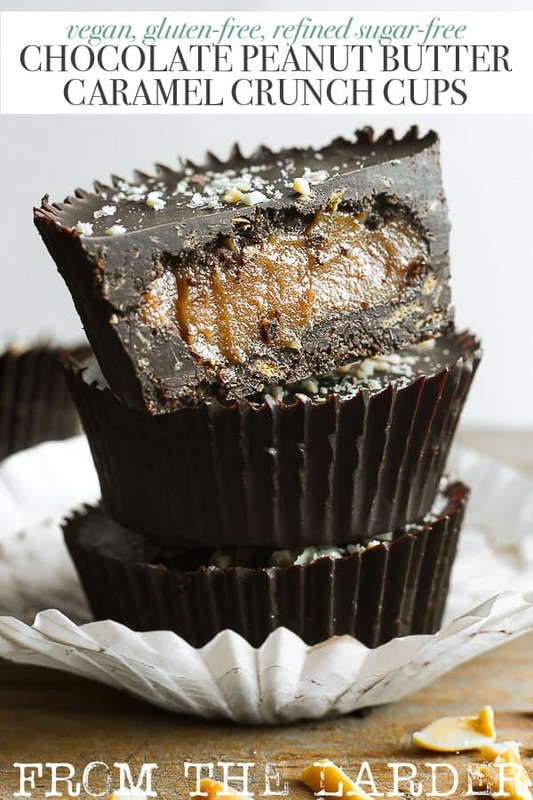 This peanut butter caramel is an utterly divine filling for our chocolate crunch cups. At first you might think this is a complicated recipe as it involves making your own chocolate and your own vegan caramel. The steps are easy though and pretty foolproof. There’s no tempering of chocolate or burning of sugar to worry about and most of the recipe is an assembly job, broken down in the method below. I urge you to give these a try or at least make your own homemade chocolate, I bet after you make it the first time it will soon become a habit. If you make these Chocolate Peanut Butter Caramel Crunch Cups then please leave a comment below and/or give the recipe a rating. If you then go on to use this recipe as a launch pad for your own baking creation then I’d also love it if you’d share it and tag me on Instagram. It is so lovely for me to see your versions and variations of my recipes. 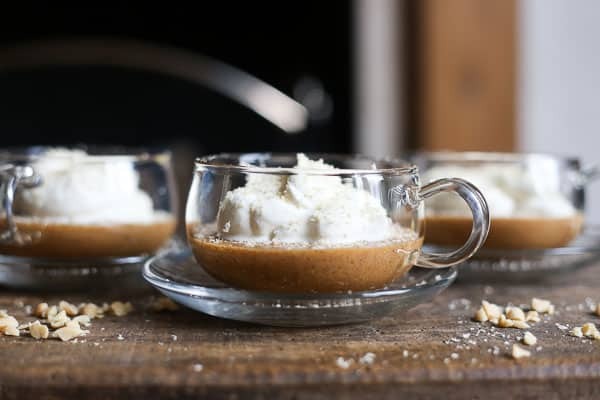 Place all the ingredients into a small food processor and mix together for 5-10 minutes so the caramel is ultra smooth. Every so often turn off the processor and scrape down the sides for an even blend. Melt the cocoa butter chips and coconut oil in a bain marie or metal bowl set over a pan of simmering water. Remove from the heat. Sift the cocoa powder into the cocoa butter then whisk in until smooth. Stir in the maple syrup, vanilla extract, salt and crushed cornflakes. 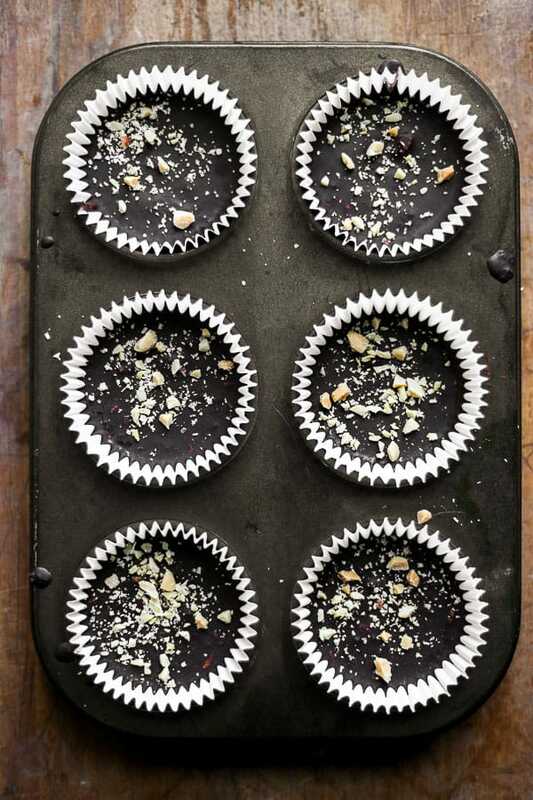 Pour 1 tablespoon of the molten chocolate into the bottom of each cupcake liner. Place in freezer for 3 minutes so the chocolate is half set. Remove from the freezer. Push the chocolate ¾ way up the sides of the cupcake liner then place back in the freezer for 10 minutes for chocolate to completely set. Remove the chocolates from the freezer. 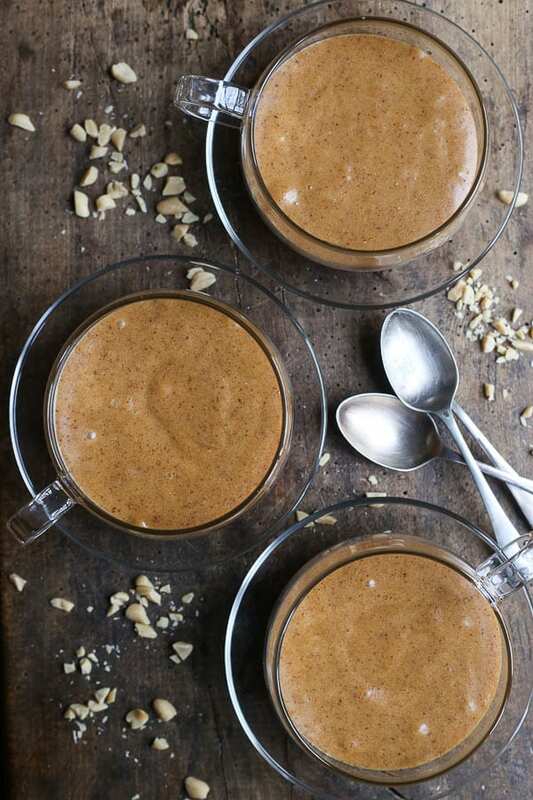 Spoon 2 teaspoons of peanut butter date caramel into each case and smooth down the top of the caramel. Pour 1 tablespoon of the cornflake chocolate over the top of the caramel so it is completely covered. Place the chocolate back into the freezer for 20 minutes to set. Remove the chocolate from the freezer, sprinkle over some chopped peanuts and flaked sea salt. Store the chocolates in the fridge. They will keep for at least a week. *use a natural peanut butter which should only have ‘peanuts’ listed under the ingredients. *The caramel cream I use is from a tin of coconut milk. If you are based in the UK then the best coconut milk brand to use is Biona as it contains no gums or stabilisers. Place your tin of coconut milk in the fridge upside down overnight. By the morning the coconut will have separated from the water, leaving you with beautifully solidified coconut cream at the top of your tin which you can scoop out with a spoon. I use the leftover coconut water for drinking, adding to smoothies, thinning out salad dressings or cooking with. are a pure ingredient with no ‘may contain..’ scariness. 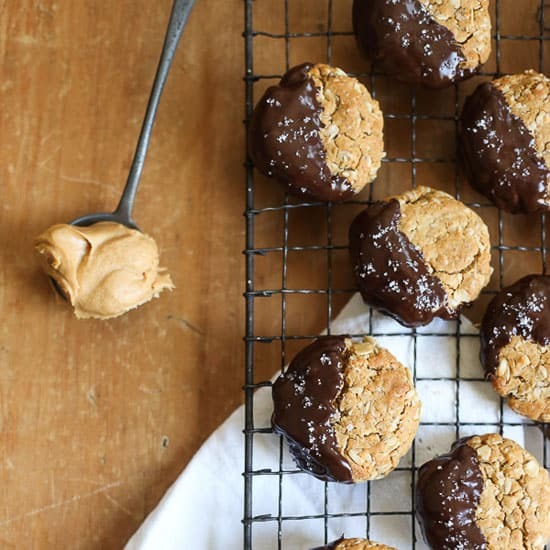 These flourless, dairy-free Peanut Butter Oaty Chocolate Cookies are no fuss to make and are one of the most satisfyingly chewy cookies you will have the pleasure to bake. Directions for converting the cookie to vegan and refined sugar-free are also included below. Sometimes you hit upon a food/ingredient/ recipe which is perfect for exactly where you are in your life. I said last week that I was having a bit of a love affair with oats but it also goes further than that. I am utterly devoted to and thinking about running away with these Peanut Butter Oaty Chocolate Cookies. They are the only thing I want to eat all the time and at this point I think my body is just being fuelled by peanut butter, oats and chocolate. It took a while to get these cookies exactly how I wanted them so I made many batches. Each one delicious but needed tweaking here and there. I am unashamed to say I pretty much ate every cookie of every batch. Despite the tweaking it turns out that you can’t really go wrong with peanut butter and oats. I have eaten these cookies by the tray load. For breakfast, for mid-morning snacks, at 3am feedings and in lieu of any meal that may have snuck up on me unawares. There is never a time for this cookie to not hit the spot. The last batch though I perfected. These Peanut Butter Oaty Chocolate Cookies were magnificent. So I did what any generous baker would do when they have hit upon cookie pay dirt, I sealed them in Tupperware and hid them at the back of the fridge without informing any members of my family. Then I ate them in secret. To be honest, it has been a little like having an affair. So many lies and deception. On more than one occasion Cole would run into the kitchen wondering what I was doing inside the fridge. ‘What are you eating Mummy?’ ‘Nothing,’ I would mumble, oats falling out of the corners of my mouth ‘Open your mouth Mummy,’ My toddler would demand. He was a lot harder to fool than Luke and I may have had to slip him a cookie or two to aid his silence. Then when I finally confessed to Luke what I had done and his feelings were a little hurt that I felt it necessary to hide such an important part of my life with him I magnanimously agreed to bake him a batch. I had run out of my stash so baking more cookies might have been on my agenda anyway. 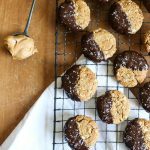 These Peanut Butter Oaty Chocolate Cookies are so wonderful as they require minimal ingredients. Seven to be exact. And only a brief moment of your time concocting them in the kitchen. They don’t have flour, just oats. They are dairy-free (if you use vegan dark chocolate) and they are loaded with hunger satiating peanut butter. Whipping up a quick batch for Luke was no hardship. I did it with my baby in a sling and my toddler standing on a stool next to me helping ‘weigh’ out the ingredients. To be honest, he was eating as much as he was weighing out. Plus he thinks that all measurements in recipes are ‘fifty hundred grams’ so he’s got a bit of way to go before he’s a completely reliable sous chef. The chocolate dip at the end, after the cookies have cooled, are not a game changer. If you just want a quick peanut butter cookie fix then you have all you need right there. But if you can’t resist a bit of chocolate with your peanut butter then I urge you not to. The dark chocolate dip sprinkled generously with sea salt is what takes these cookies to above and beyond the call of duty. I had to keep them in the fridge so the chocolate didn’t melt on the crazily hot day we had in London last week (our premature summer didn’t last, yesterday it was hailing golf balls) but actually that worked in its favour. I loved the cookies straight from the fridge and the fact that the chocolate hardened into a crisp shell surrounding its chewy peanut butter interior. The only thing I would ask of you when making these cookies is that you use natural peanut butter without salt (or any other ingredient for that matter) and use it from the top of the jar when it’s still beautifully golden and runny. You don’t want the hard stuff that’s been languishing at the bottom of the jar for a few weeks as the cookies won’t have enough moisture to hold together. However, I have made them with the peanut butter remnants at the bottom of the jar and if that’s all you have and can’t be bothered to nip to the shops then just add a tablespoon or two of milk (I used coconut milk) for extra moisture. I also, for good measure, tested this recipe as a vegan and refined sugar-free recipe. The cookies were still good so by all means go down that route if that’s the only way you would get to try these cookies. I just preferred them made with an egg and a bit of brown sugar. For the vegan cookie, replace the egg with a chia egg and for the refined sugar-free version, replace the brown sugar with dates. 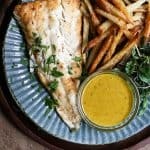 The notes on these changes are included in the recipe below. Now, you must rush to the kitchen immediately and bake up these bad boys. Although you might not forgive me if you become as obsessed with them as I am. 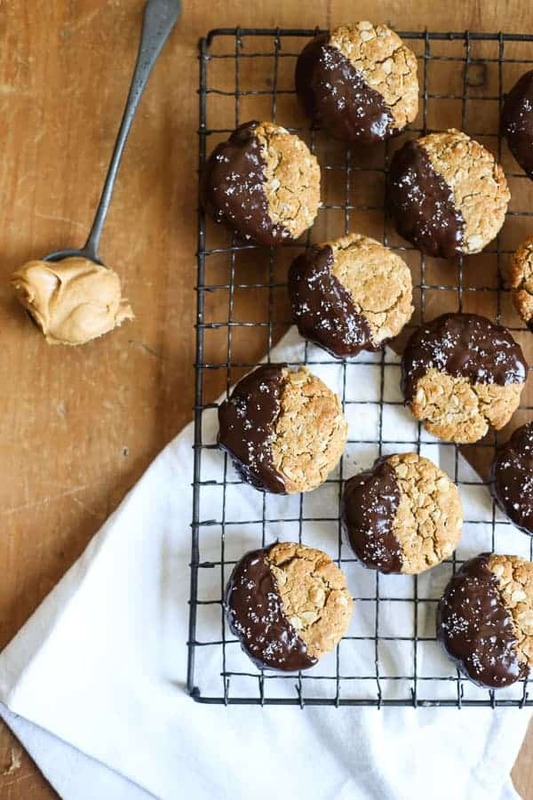 These flourless, dairy-free Peanut Butter Oaty Chocolate Cookies are no fuss to make and are one of the most satisfyingly chewy cookies you will have the pleasure to bake. Whisk the egg and sugar together in a large mixing bowl until pale and smooth. Add the peanut butter, oats, bicarbonate of soda and sea salt and mix until the batter is smooth and thick. Using the palms of your hands roll up the dough into balls of about 45g each and place on a baking sheet a couple of inches apart. Press down slightly so the top of the cookies are flat. Dip each cookie in melted chocolate and sprinkle on sea salt then leave to set. *For a refined sugar-free cookie, replace the sugar with 8 pitted dates, blended to a puree. The mixture will be a little stickier before going into the oven but comes out pretty much the same cookie consistency. 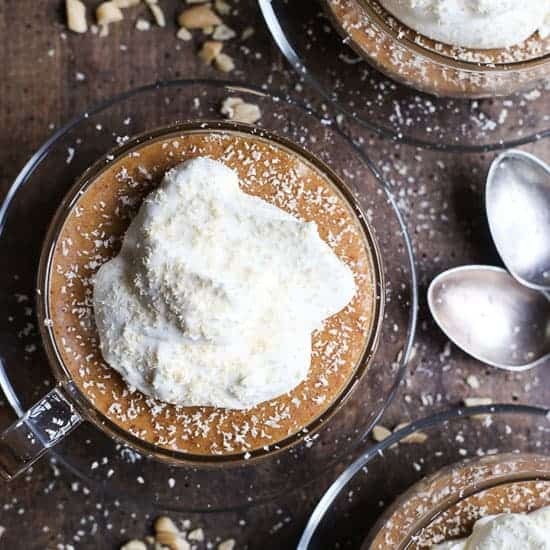 Salted Peanut Butter Blond Chocolate Mousse is for lovers of all things peanut butter and butterscotchy. Rich, indulgent and definitely destined for special occasions. My love for all things peanut butter and chocolate knows no bounds. At Christmas, knowing Luke would include some sort of chocolate in my stocking I gave him a gentle hint that the best received chocolate would involve caramel or peanut butter. He complied and all was well on Christmas morning. Peanut butter and blond chocolate though hadn’t been something I had thought to put together before, but my gosh does it work like gangbusters. I have played around and experimented with blond chocolate many times, its smooth butterscotch taste is sweet, toasty and with a more adult caramelised taste than white chocolate. I have also included a blond chocolate mousse on this blog before thanks to the ultra indulgent Blond Chocolate Mousse Cake which you can find back in my archives and which I have been intending to take new photos of for a while since my old ones really don’t do it justice. In fact that was this intention for this post but suddenly I found myself reaching for the peanut butter and stirring it into the melted blond chocolate on a whim. This suddenly became a mousse that shouldn’t be included as part of a larger recipe as it was too damn delicious in its own right. The earthiness of the peanut butter pairs brilliantly with the smooth sweetness of the blond chocolate. The mousse is incredibly rich though so it does need the good dollop of unsweetened whipped cream adorning the top to temper its decadence. 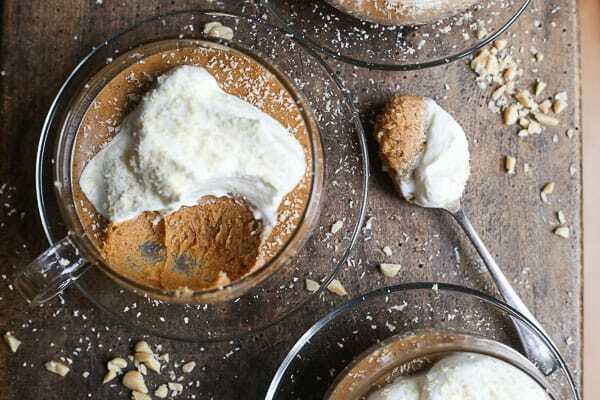 As such you also don’t need much of the mousse to satisfy, even though at first bite you think you could probably eat about four bowls of the dessert to yourself. Blond chocolate isn’t cheap. 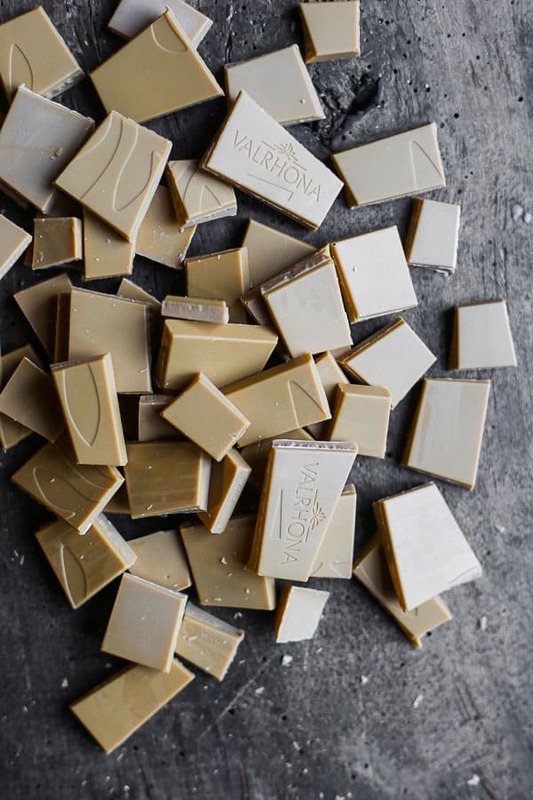 The brand I like the best is Valrhona and your best bet is to order it on line via specialist chocolate stockists like Chocolate Trading Co but that’s why it’s perfect for special occasions, like Valentine’s Day which I hear is just around the corner, as it really isn’t something you would knock up for an everyday dessert. However, it’s still easy and quick to make so you won’t be messing around in the kitchen for too long. As a bonus you can whip it up in advance so you get maximum effect for the simple effort of 20 minutes of prep the day before. 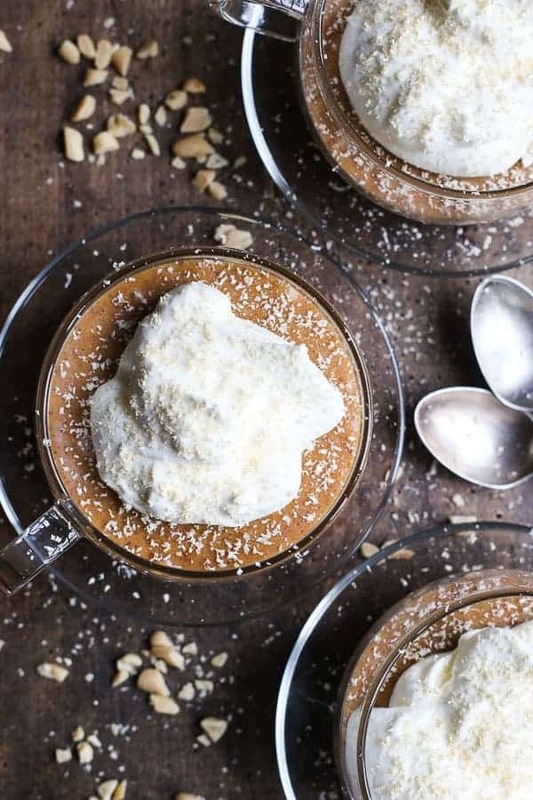 If you love peanut butter and chocolate and want to make something a little special and different then I couldn’t recommend this Salted Peanut Butter Blond Chocolate Mousse enough. Super indulgent and delicious. Melt the chocolate in a bain marie or a bowl set over a saucepan of simmering water. Once the chocolate has melted then stir in the peanut butter until smooth. Remove the chocolate peanut butter from the heat and let cool for a couple of minutes. Lightly whisk the egg yolks together then pour carefully into the chocolate peanut butter, stirring to combine. In a very clean bowl whisk the egg whites to firm peaks. Using a metal spoon, fold the egg whites into the chocolate mixture to loosen it, then carefully fold in the rest. Divide the mousse equally into four serving bowls or glasses. Place in the fridge to set for at least 2 hours. Just before you are ready to serve, whisk the whipping cream until thick and floppy and spoon equally over the top of each individial mousse. Decorate with shavings of blond chocolate. These Banana Peanut Butter Streusel Muffins are fluffy, generous and richly flavoured. What’s more they are vegan and gluten-free to boot. I have found myself getting more and more interested in vegan baking. It began at the farmer’s market when the usual vegan cake stall took a few weeks absence and I was inundated with requests for vegan cakes in the interim. Being a free-from baker naturally lends itself to such enquires and I welcome them. I love a project and removing eggs and butter from the equation certainly challenges an enthusiastic baker. I myself am not vegan, although these days I do try to avoid dairy. From childhood I have always had a problem with milk, claiming drinking it made my ‘ears pop.’ I don’t know what that means now, in fact my nursery teacher didn’t know at the time either and I have horrible memories of being forced to zap the stuff up through a straw from little milk bottles, sitting in a torturous circle with the other children. My poor childhood trauma. It seems since having Cole though (two years ago this week!) my dairy intolerance has increased. So vegan cakes and dairy-free cakes have started to hold more interest for me. Experimenting with non-dairy, no egg cakes has been fraught with failure. I mastered a Chocolate Almond Butter Fudge Cake for the stall quite quickly, which I’ll be sharing the recipe of soon, but some vegan customers at the stall always seemed disappointed when a chocolate cake was the only vegan option. It seems bananas are the next step in vegan baking, combined with the peanut butter here they bind the cake together well without the need for an egg substitute like a chia or flax egg. In fact the crumb is so fluffy that the sponge is a bit of a revelation. There is a fair amount of leavening used with the baking powder and bicarbonate of soda but that doesn’t bother me and the effects can’t be tasted. I do love a muffin with a hearty streusel so here I have gone haywire with chopped banana chips and salty peanuts. I always make the streusel topping for the muffin first and then place the topping in the freezer to firm. This helps the streusel from sinking into the muffin when it goes into the oven and retain a crunch. If you leave the streusel in the freezer for too long don’t worry at all, just chop roughly with a knife or pulse quickly in the food processor to loosen the crumbs. 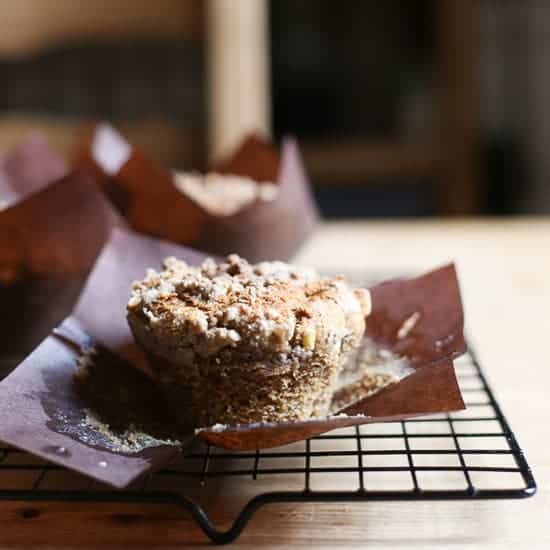 The Banana Peanut Butter Streusel Muffin is also gluten-free. I chose sorghum flour, which is demanding in its presence but its earthy tones pair well with the bananas and peanut butter so it doesn’t overpower the cake but blends nicely. It’s included in my current favourite combo of gluten-free flours, sweet rice flour, millet flour, potato starch and tapioca starch which together create a lovely texture for the muffin and are a good base for the sorghum flour to shine. Creating cakes which are gluten-free, vegan but can also pass muster with friends, family and customers who can eat anything is actually brilliant fun. So far I have been rewarded with some truly outstanding cakes and although the blog itself isn’t going to turn vegan anytime soon, I will definitely be including more vegan recipes in my repertoire. Pre-heat the oven to 160°C and line a muffin tin with muffin cases. First prepare the streusel by whisking the flours, sugars, banana chips, peanuts and cinnamon together. Rub the coconut butter into the dry ingredients until you have achieved a rough crumb. Spread the streusel out onto a lined baking tray and place in the freezer whilst you prepare the rest of the muffins. In a large bowl whisk together the flours, cinnamon, baking powder, bicarbonate of soda and salt and set aside for a moment. 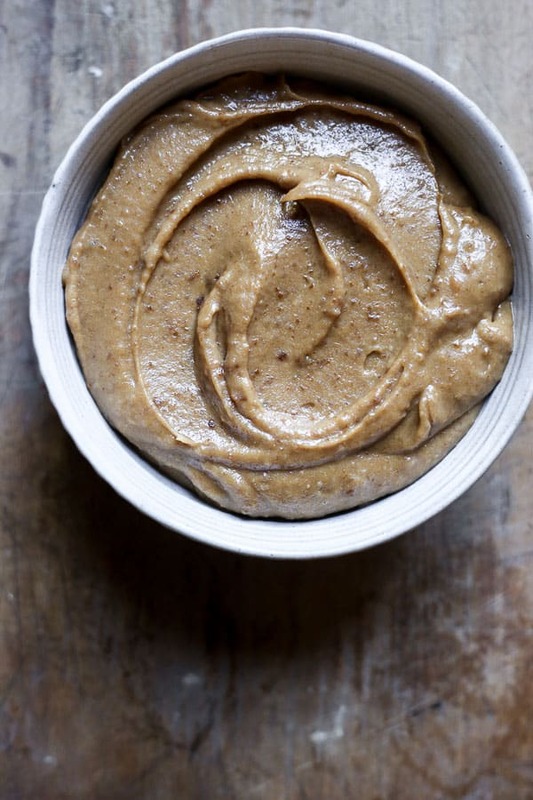 Beat together the almond milk, olive oil, mashed bananas, peanut butter, sugars and vanilla extract. Divide the batter evenly between the cupcake cases then sprinkle over the streusel topping. Bake for 25 -30 minutes, or until an inserted cocktail stick comes out clean. Remove the muffins from the muffin tin straightaway and cool on a wire rack. *coconut oil, solidified. If your kitchen is especially warm then refrigerate the liquid coconut oil to solidify. 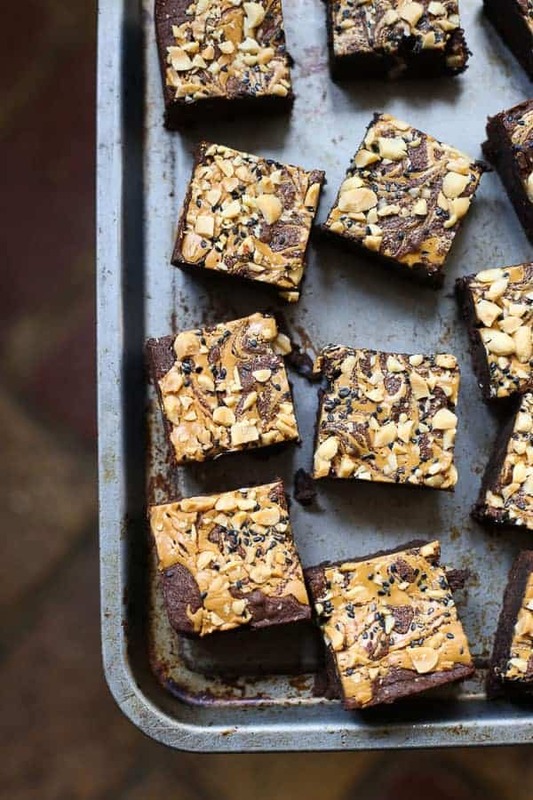 Black Sesame Peanut Butter Brownies are a richly decadent fudgy treat. 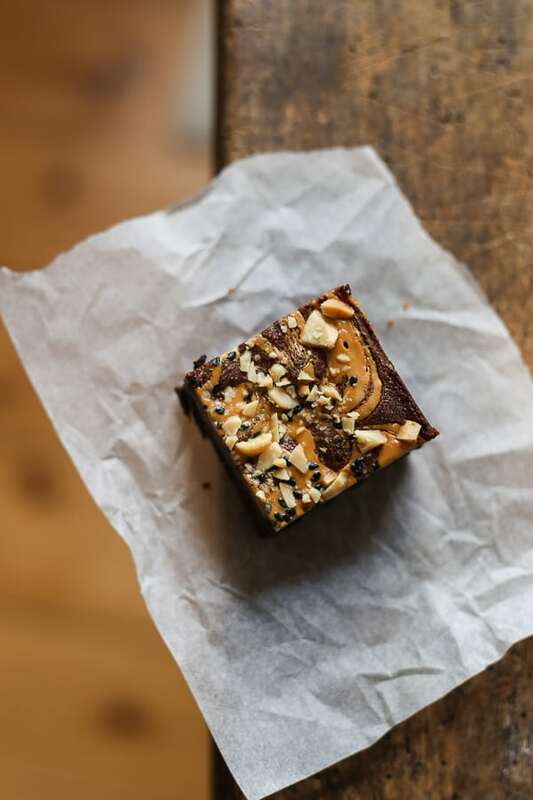 Packed with honeyed black sesame, swirled generously with peanut butter layered through the brownie and topped with salted peanuts and black sesame. It’s important to have a particularly good brownie in your back pocket and this is mine. Well it was anyway. 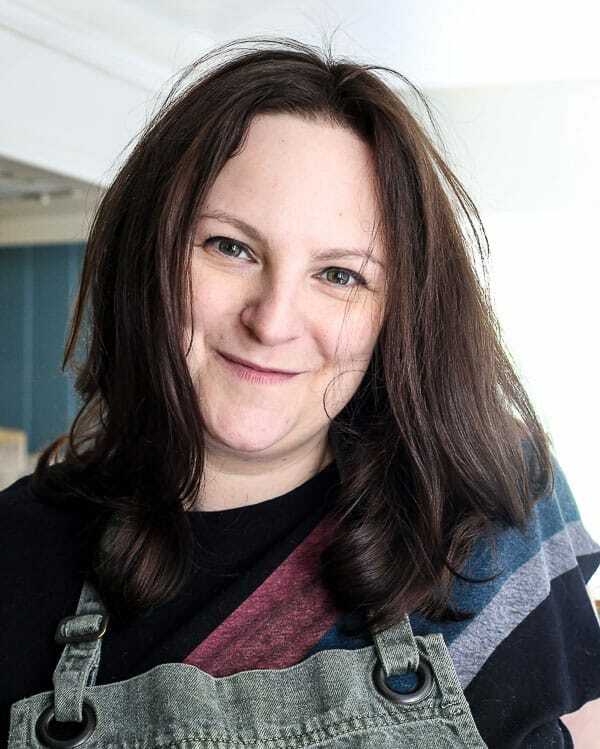 For years, happily attending cake stalls with me, being brought to hen weekends, or baked up in a big old batch when only the dark intense comfort of chocolate can satisfy. The thing was, that as it stood, my brownie recipe was created with plain old wheat flour. As I transitioned to a 100% gluten-free way to life last year I just couldn’t abandon my tried and true Black Sesame Peanut Butter Brownies on the wayside. So I set forth on a quest to make them gluten-free without losing any of their taste or texture. 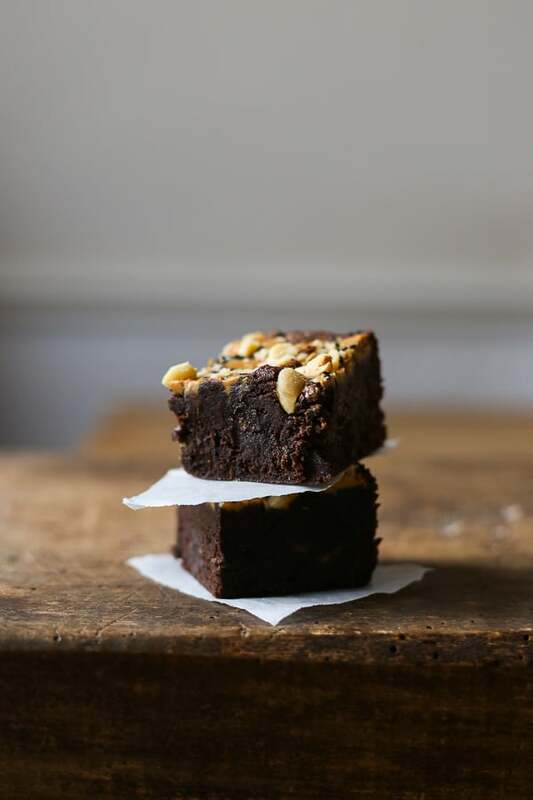 If you’re interested in reading about how you might change a brownie recipe made with wheat flour to a gluten-free version which is just as wickedly delicious then do read on. I can’t lie this brownie is not the same beast as it was back in its old wheat incarnation. No, when I made the switch I opted to inject more flavour into this already wonderful brownie and the flours used intensified its fudgy interior. 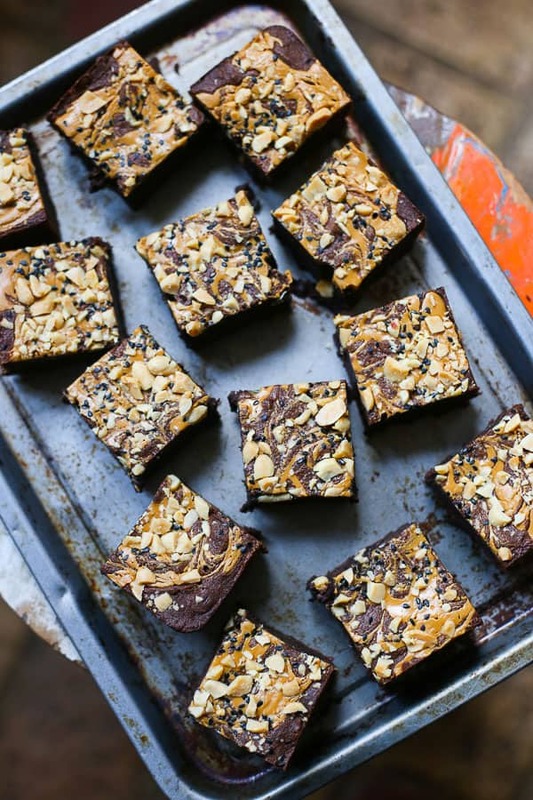 Instead this gluten-free Black Sesame Peanut Butter Brownie is better than it ever was before. 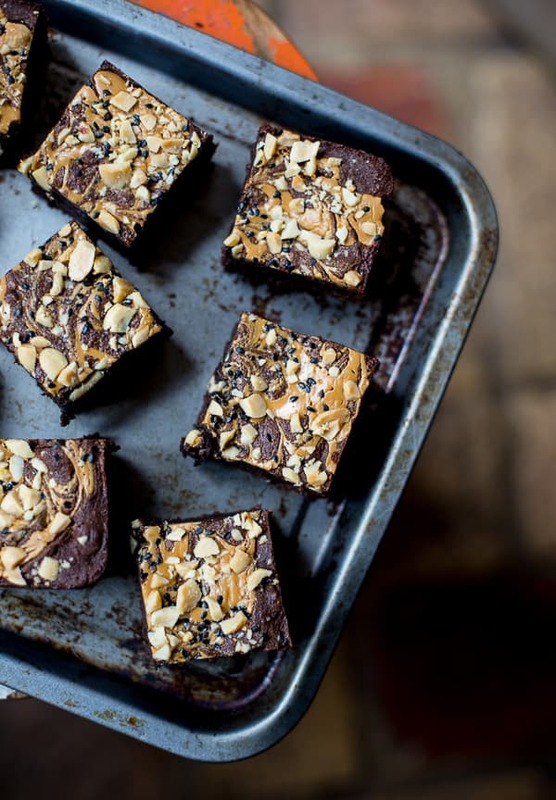 How do you make a brownie recipe gluten-free? In a lot of brownie recipes flour is almost an afterthought which is why they are so easy to make gluten-free. 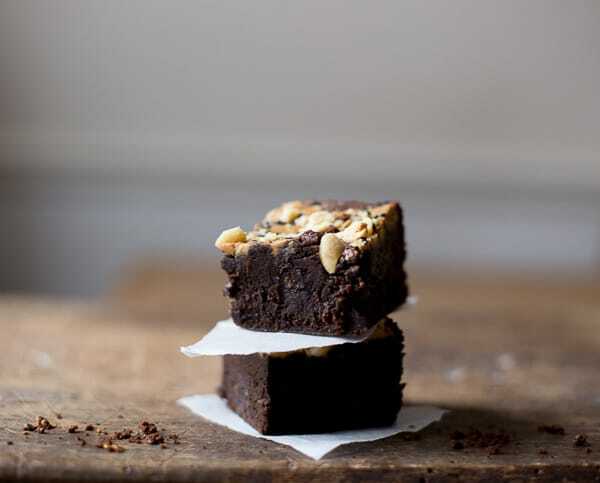 If a brownie recipe uses less than 100g of plain flour then try just swapping in a generic gluten-free flour blend. You will barely notice the difference. 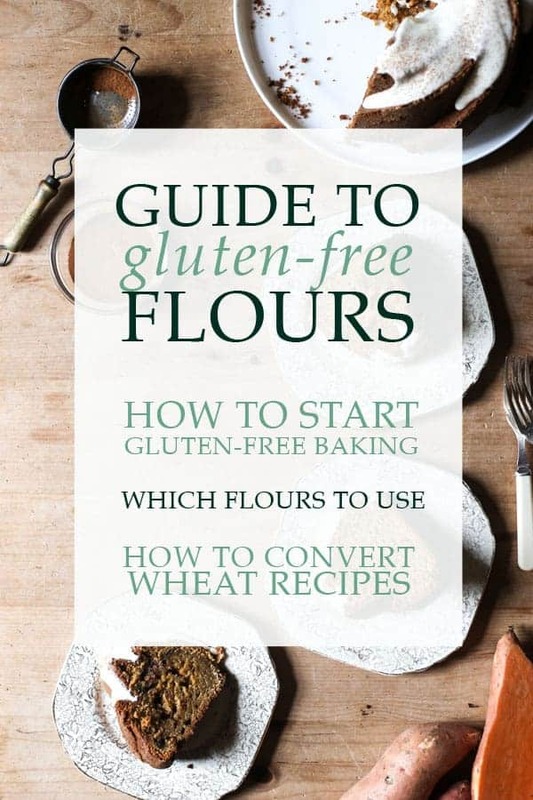 Though if you rely on these blends for recipes which require a lot more flour then you will become aware of the slightly gritty, more crumbly qualities that bad gluten-free baking is famous for. 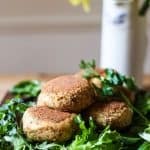 You might even decide if there is only a scant amount of flour involved that you would like to substitute ground almonds which would be an excellent decision. 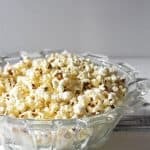 You will certainly notice a difference in taste and texture if you go this route but it will be a delicious one, more squidgy and flavourful and of course packed with protein – practically a healthy snack. 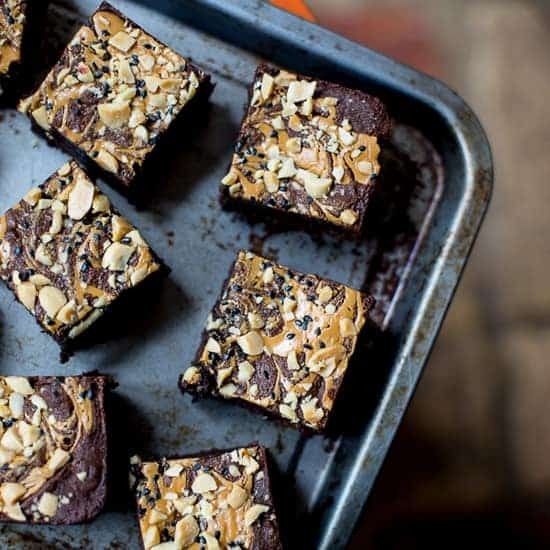 These changes wouldn’t work with the Black Sesame Peanut Butter Brownie though as not only would almonds compete with the layers of flavour this brownie is already boasting but it also required 175g of plain flour which is a fair amount for a brownie and too much for a straight swap of a gluten-free flour blend. When I initially created this recipe I wanted the brownie to be bigger, bolder and better than other brownies I had tried so with the 300g of melted dark chocolate and 4 eggs in the mix that large amount of flour was needed to hold the brownie together. Gluten-free baking is a challenge but also really good fun as the playing field is wide in terms of which flours you choose to use for which cake. It gives the baker an extra element of control and is so satisfying when you get the exact right blend of flours right. Here I had a lot of flour to play with and I didn’t want to lose the integrity of the original brownie so I had to choose wisely. I plumped for teff flour as the lead flour for flavour. Teff is an ancient Ethiopian flour with a slightly malty cocoa aroma and so it is not an unusual choice for a brownie. The teff flour adds an extra element to the brownie batter, providing a subtle landscape for the black sesame and peanut butter flavours. However, I didn’t just want to swap in 175g of teff flour as the taste would be a little overwhelming plus the brownie would probably cave in on itself due to the fine nature of teff flour. Somehow I needed to replicate the job the gluten makes to hold it all together. This is where the tapioca flour comes in. Before gluten-free baking my tapioca flour would only ever emerge when I made a fruit pie recipe, as it’s often used to thicken up the juices so to avoid soggy bottoms and create a silky fruit sauce. Now tapioca flour has become a firm friend of mine. A couple of tablespoons here and there help enormously to bind flours, warding away the threat of crumbly dry cakes. 25g is all that is needed in this brownie, you don’t want too much lest the cake gets gummy. However I still needed a little extra flour as I was lacking in bulk, I chose to split the difference between white rice flour and potato starch, both great neutral flours. I used 25g of each but you can use 50g of either for simplicity if you like. The new improved Black Sesame Peanut Butter Brownie is finally ready to share with the world. It’s still my absolute favourite brownie recipe, now even more so with the added benefits of teff flour. The effect of intoxicating black sesame seeds, gathered into a paste with honey and married with the peanut butter swirls is glorious. The crunch of salted peanuts and black sesame seeds scattered across the top takes it to another level. These photographs were taken in collaboration with the brilliant Tara Sura from Fork and Dram who I had the pleasure of working with recently. 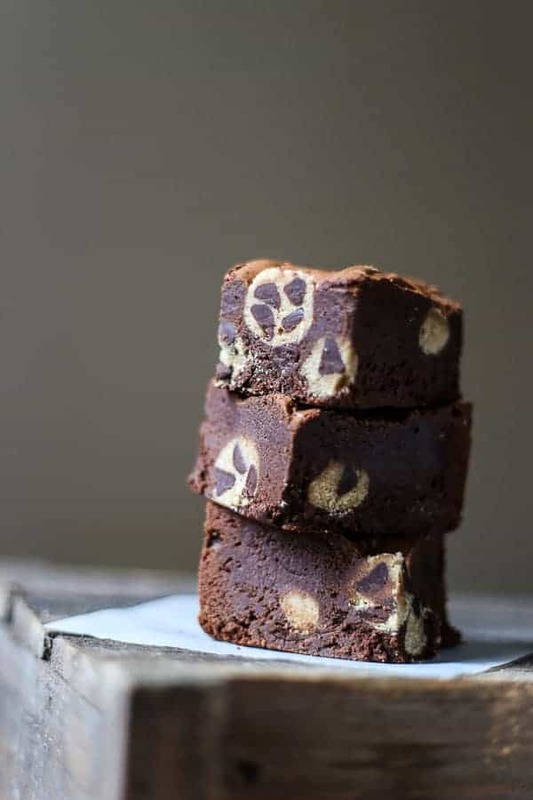 She did a beautiful job styling these brownies and most of the above images were taken by her. 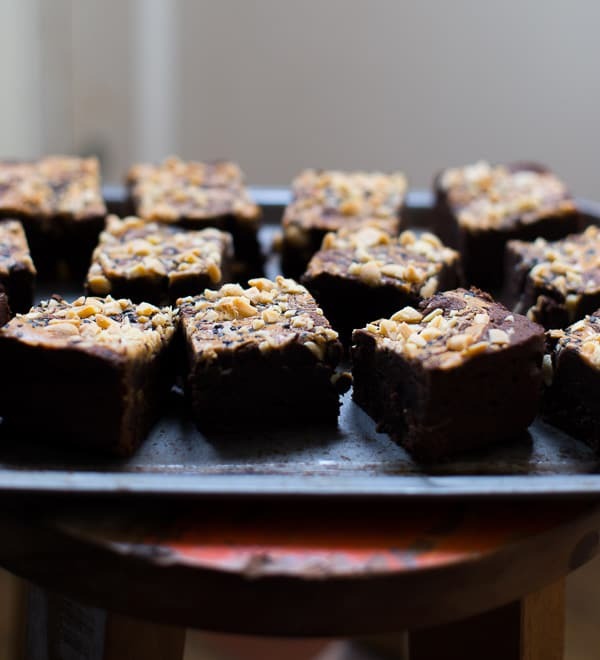 Fudgy gluten-free Black Sesame Peanut Butter Brownies are packed with honeyed black sesame, swirled generously with peanut butter layered through the brownie and topped with salted peanuts and black sesame. Pre-heat the oven to 150°C and line and grease a 20cm square cake tin. 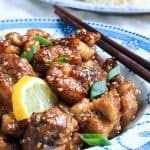 Pour the sesame seeds into a food processor and whizz for 5-10 minutes until the seeds are broken down and are beginning to release their oils. Then add the honey and continue to process until smooth. Set aside. Heat the peanut butter until melted and pour into a piping bag. Set to one side. Melt the chocolate slowly in a bain marie then also set aside. Meanwhile beat the butter and sugars together until light and fluffy. Add the eggs one at a time, mixing in well. Then add the vanilla extract. Pour in the melted chocolate and the black sesame paste and mix well. In a separate bowl sift together the flours and cocoa powder then fold into the rest of the batter. Pour half of the brownie batter into the cake tin. Then pipe the molten peanut butter in zig zag lines on top of the batter. Using a wooden skewer, draw continual circles through the peanut butter lines to create a swirl pattern. Pour the rest of the brownie batter over, smooth the surface, then pipe and swirl the rest of the molten peanut butter in the same way. Scatter the salted peanuts and remaining black sesame seeds over the top. Bake for 25 minutes in the centre of the oven. Once cool cut into 12 squares. If I think back to what I have eaten over the past 7 days, I can really only think of these biscuits. I came up with the idea last weekend after I had finished rolling out the pastry for my Eccleswell Tart. I had a little bit of pastry left over, a tub of peanut butter was sitting next to me and a few minutes to kill whilst I was waiting for my tart shell to chill in the fridge. I dolloped a few tablespoons of peanut butter in with the leftover pastry, rolled it out and cut it into very rough squares. I threw them in the oven for about 6 minutes and I was rewarded with these extremely tempting biscuits. I ate the first one hot out of the oven and thought, yeah alright these are a nice use of the excess pastry. Then ten minutes later as I was making a cup of tea I ate another, this time a little cooler. Hmm, actually these are quite nice. Then my husband came down and grabbed a couple. He concurred that yes they were quite good. Half an hour later as I was finishing off my tart I munched a couple more biscuits, then after another hour I went back into the kitchen to faff and found my husband scarfing down another. By the time we were settling down to watch TV in the evening I was upset to discover that we had both polished off the whole tray. But I want more, I thought petulantly. It turned out that they were more than a bit nice, they were completely and utterly addictive. So the next day I made some more, this time making the pastry especially for the recipe. And the next day I made some more, this time with a couple of bars of milk chocolate by my side. 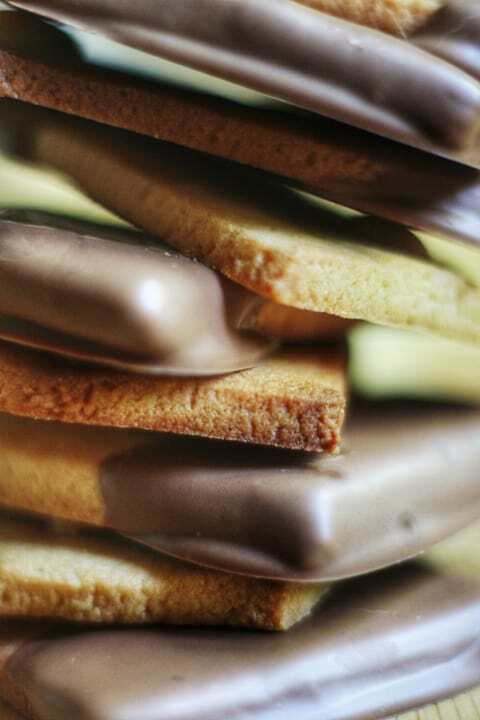 Now, it’s not to say that the biscuits need the chocolate in any way, they are pretty delicious without. But peanut butter yearns for chocolate like Catarina for Arturo and it seems only fair to unite them at any given opportunity. The peanut butter flavour is subtle which makes such a nice change from the ever prolific peanut butter cookies, which believe me I have no problem with, but they can sometimes feel heavy on the palette. These biscuits are excellent for dunking in tea, if you are so inclined, and would look pretty at an afternoon tea which isn’t something you can usually credit to peanut butter which is about the least sophisticated ingredient out there. The little peanut nugget baked into the biscuit is in no way essential but the salty hit is too good to miss out on. 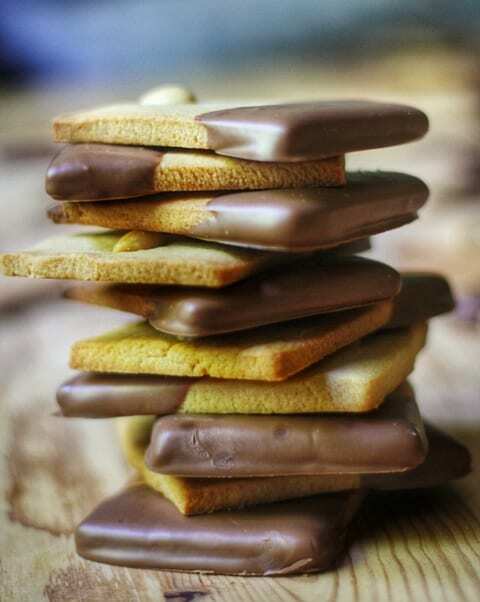 I didn’t use tempered chocolate here when I dipped the biscuits as I wanted a nice quick homestyle biscuit. The results were fine, although next time I might contemplate using tempered chocolate as the biscuits didn’t transport easily. The chocolate never hardened so they were easy to damage as they were bashed about in a tin. However, since I had to make about 3 batches of the peanut butter biscuits before they made it to the chocolate dipping stage it is unlikely that these will go much farther than the kitchen counter to your mouth. I sped up the recipe by bringing the biscuit dough together in a food processor. I wouldn’t normally do this with pastry as the results are not quite as good but I wasn’t too worried about that for these biscuits. In all honesty if you are pressed for time you could also skip the resting stage but your biscuits won’t be quite as crisp and flaky. Pulse together the plain flour and the unsalted butter in a food processor until they resemble rough breadcrumbs. Add the caster sugar and pulse again briefly until evenly mixed in. Add the egg and the smooth peanut butter, then whizz up until it is starting to ball up in the processor. Tip it out onto a clean work surface and bring together into a smooth dough, it will still be slightly sticky. Wrap in cling film and leave to rest in the fridge for 30 minutes. Remove the peanut butter dough from the fridge and roll into a rectangle about 3mm thickness. Cut into about 20 rectangles then place on a large baking tray. 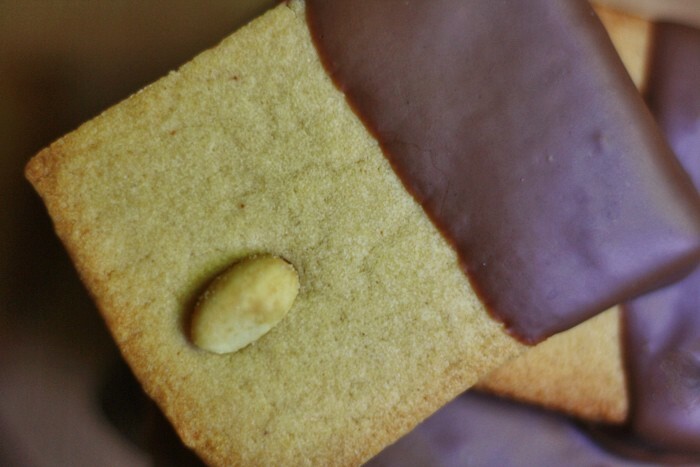 Press a peanut half into each biscuit then place the baking tray in the fridge for half an hour for the biscuits to chill. Then bake for 6-8 minutes then remove from the oven. Leave to cool on the tray for 5 minutes then place on a wire rack to finish cooling. Once the biscuits are cooled melt the chocolate in a bain marie. 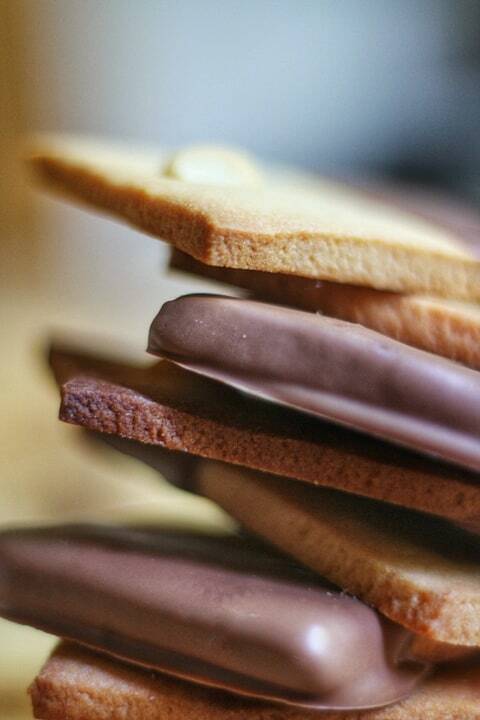 Dip the biscuits into the chocolate one at a time halfway up the biscuit then leave to set on some baking parchment.